Victoria, Mahe (Seychelles) – October 23, 2017 (travelindex.com)- Seychelles today has embraced change. Some change everyone is happy with, others are being questioned, but change is here and the people remain determined to see it through because it should safeguard the industries that keep the economy of the islands moving. The conditions to make things work are important for everyone, this is why every Seychellois needs to remain positive. Negativity will just drag the country down and hurt the people as it hurts the economy. Good news for the tourism industry this week as a couple are jailed after their £20,000 food poisoning claim from a Thomas Cook trip to Majorca are exposed as FAKE. The continuous torment for Hoteliers facing deductions from their invoices may well come to an end now that a precedence has been set after a successful challenge. From the UK alone, the holiday sickness bug claims had risen by 500% said the Daily Mail in the UK on the 13th October. It was the Tour Operator holiday company Thomas Cook who, in a private prosecution case, saw a British Couple sentenced to nine months and 15 months respectively, in jail for their claim for compensation by stating they and their two children had fallen ill on holidays in Majorca in 2015 and 2016. Tour Operators are the partners of the hoteliers and with their local DMCs (Destination Management Company) must work as one to fight off claims that are far fetched and often raised by holiday makers who have become experts at raising such claims. Peter Sinon, the Secretary General (elect) of the new Seychelles Labor Union stood with the nurses last Saturday as they demonstrated in Victoria for better working conditions. The new Workers Union remains one that is not affiliated to a Political Party and looking at the best interest of workers and encouragement for the businesses to ensure they can employ more Seychellois. Members of the Executive Committee come from all the political colours of Seychelles and two of the leaders of the new Union were part of the Government of the day. Peter Sinon was a Member of the Central Committee of the LP Political Party until he handed his resignation some three weeks ago. Alain St.Ange, on his part, happily says he is only a Seychellois and belongs to no political party having resigned form the ruling party (SPPF, the predecessor of LP) in 1981. He was then a member of the Opposition Party at the start of what was the transition to the third republic. He joined the Government as Minister but was not a member of the ruling party. Since all the excitement about the arrival of the new Labour Union, the Alain St.Ange / Peter Sinon Team have been meeting with the Stevedore Workers, the Nurses, the Taxi drivers, small hotel owners, hotel workers, cargo truck drivers, IT technicians, Civil Servants, Air Seychelles Staff, Transec Staff and this week with the Teachers.They have also received a letter from the Civil Status employees seeking support for their grievances. For the Teachers meeting they were joined by Marie France Marie, the Secretary (elect) of the Union. The Seychelles Labor Union (SLU) has said that they will be standing for all who are working and this includes the salaried employees as well as the self-employed business men and women of the islands. At the end of the day, everyone is working and are therefore workers and they need a politically independent body to be by their sides. Workers will be Recognised, Respected and Remunerated for their respective efforts and in return a Responsible and productive workforce will now help Seychelles grow. Tourism & cost is the talk in the hospitality and tourism circles. The new tax on the higher salaries seems to be a fait accompli, but has Seychelles looked at the implications of this move? Any employee who will be hit by a higher tax bracket will not accept to have a take-home pay that is less that what they were on before, and this will result in businesses having to increase their salaries to make up for the shortfall. Any increases in operational costs will then be passed on to clients, and for the tourism industry, the visitors to Seychelles will be expected to pay. How much more expensive can we become before we start pricing ourselves out of the market is the BIG QUESTION for the tourism industry of Seychelles and all the staff working in that industry? “ASNZ” is a new NGO that was conceived from the crying out for help by local super star singer and comedian Joseph SINON (my cousin). After two years living with his only son who is addicted to heroine Joe came out on Facebook in public – “please help me, I am loosing my son to drugs”. As family, we rallied to Joe and found that his message resonated with a large number of people who claimed to be in the same situation. It was then that we realized that the issue is not a family matter but has got national reverberations. Thus the motivation to create a Non-Governmental Organization to operate on a national scale. The above relatively new Non Governmental Organization (NGO) was thus formed out of heightened concerns for the rapid increase in substance abuses, especially of heroine addiction – nicknamed ‘the white lady’. The NGO aims to work with parents of addicts, being the majority respondents to Joseph’s call. ASNZ will also bring information and awareness about the dangers and consequences of substance (especially drug abuses) to the children and teenagers. Finally it aims to mobilize the communities to act in unison to express their desires to rid the sale of drugs in their respective districts and engage in various forms of harm reduction practices for addicts under counseling on the road to rehabilitation. The unprecedented rise and propagation of heroine amongst the youth is having alarming adverse consequences. Petty and more worrying crimes are on the increase, productivity is affected and the scourge is becoming a substantive concern in the tourist paradise where the aforementioned is the main-stay of the economy. Security and stability that are both key for the industry is increasingly being compromised. ANSZ organized a half day retreat recently. Most of the participants – members of the ASNZ – were mothers of heroine addicts. A special guest, former alcohol addict who has been sober for 37 years shared his experiences. One thing that was emphasized was ‘once an addict, always an addict’ and the message was that it does take deep resolve and determination to stay sober once an addict decides to rehabilitate and overcome his or her addiction. In this gathering, two young recovering heroine addicts shared their respective harrowing experiences. Their testimonies and continuing struggles brought to light the addictive power and strength of the ‘white lady’ once it has its grip on a human being. The alcohol addict spoke of the addiction as a disease of the soul. It was very clear that when it comes to heroine addiction the referred “emptiness” that was referred to by the addicts is even more profound. The two addicts confessed that one would do almost ANYTHING to have it when they have their craving and that nothing else in life matters – a person addicted to heroine has no conscience as nothing is too precious to sell to feed their addiction at its zenith. Detoxification and rehabilitation is not easy and the risk of relapses are frequent especially when addicts return to the same environment in which they became addicted in the first place. The mothers and fathers shared their experiences and it was clear that they were often torn between reporting their child or children in cases where there’s two or more who are addicted. Some confess to having had no choice but to feed the addiction of their beloved children since they felt alone, isolated and sometimes scared. They, as much as possible, tried to keep the problem in the family and out of the prying eyes of neighbors, other family members and especially the legal authorities. Whilst the former is mainly because of the stigma of shame that goes with the scourge, the latter is due to the fear of having to banish their child or children to the state prison, where the parents claim that their beloved offspring/s will most certainly come out worse than they go in. After group work and exchanges a number of recommendations were put forward. One of the main consensual recommendations is for ASNZ to have a multipurpose location that can be used as a secretariat, a drop-in centre for a pool of addicts and their parents and relatives in the surrounding districts or in the region where the operations of the ASNZ can be carried out. The Government, through its Minister of Land Use and Habitat (MLUH), has been contacted for a location or a parcel of land for the construction of such a centre. The Committee has discussed and agreed on the requirements of such a centre and feel it would be much better to build a custom made building from scratch to suit the multi-functions that are planned. However at this stage the demand is an urgent one and the association is willing to compromise and adapt a building if one can be found. While the hard infrastructure is a central and urgent requirement at this stage, ASNZ also wants to extend its network and outreach with professional outfits and individuals that are involved in counseling, rehabilitation and harm-reduction practices for drug addicts. Support for parents affected by this scourge also needs attention. ASNZ will require as much support and assistance as possible to meet its goals and objectives. Should anyone want to find out more about how they could assist – please do not hesitate to contact us. A wedding competition saw the Seychelles destination splashed across headlines and airwaves all across Ireland leading up to the announcement of its winners last month. 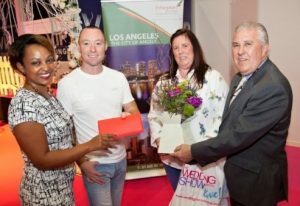 Organised by Ireland’s Wedding Journal, the “Win a £35,000 Wedding” competition featured an all-expenses-paid wedding and honeymoon to Seychelles, with promotions on radio, print and billboards along with digital and social media publicising the prize. The winning couple, Stephen Dempsey and Sarah Carney, will enjoy hotel stays at CaranaBeach in North Mahé, as well as Denis Private Island. Ethiopian Airlines sponsored a pair of business class tickets from Dublin to Seychelles, while Mason’s Travel is handling ground transfers. Mason’s Group PR, Branding and Communications Manager Nicole St Ange said that participating in high-profile national competitions in important tourist markets allows a small country like Seychelles the ability to punch above its weight in the marketing arena. Ireland’s Wedding Journal is the top bridal magazine in Ireland with over 80,000 readers and an audited circulation of 10,792. The electronic version of the magazine generates more than 250,000 page views per month from over 80,000 visitors, making it Ireland’s leading wedding portal while featuring Ireland’s top wedding directory, Dress Finder and Venue Guide. The annual Festival Kreol was officially launched last Friday night the 20 October at the ICCS (International Conference Centre) Grounds in the presence of President Danny Faure, Vice President Vincent Meriton, Speaker of the National Assembly Patrick Pillay, President of the Court of Appeal Francis Macgregor, Ministers, Members of the Diplomatic Corp and many other invited guests. Also present was President Didier Robert, the President of the Regional Council of Reunion. This year the Festival was set in what was called a Creole Village. The Opening musical show was based on tradition with a modern twist and it was Minister Mitcy Larue, the Minister responsible for Culture and Chairperson of the Festival’s Committee who officially opened the Festival. The celebrations are spread over a ten day period and will close in the 31st October with the traditional all night dance at the Kreol Institute. The 27th Airports Council International (ACI) Africa/World Annual General Assembly, Conference and Exhibition was in Port Louis, Mauritius, under the theme, “Bold Leadership in a time of change.” The conference is hosted by Airports of Mauritius (AML). Over 500 aviation professionals gathered for the Official Opening of the conference, where welcoming remarks were given by Johnny Dumazel, Chairman, AML & ATOL; Angela Gittens, Director General, ACI World; Declan Collier, Chief Executive Officer, London City Airport and Chair, ACI World; and, Engineer Saleh Dumona, Managing Director, Federal Airports Authority of Nigeria and President, ACI Africa. Following the welcoming addresses, delegates were fortunate to hear from keynote Dr. Olumuyiwa Benard Aliu, President of the Council of the International Civil Aviation Organization (ICAO); and, The Honorable Pravind Kumar Jugnauth, Prime Minister of the Republic of Mauritius. For the panel discussions on “Taxes, connectivity and sustainable tourism: barriers and opportunities to grow” Vijay Poonoosamy, Vice President International Affairs of the Etihad Aviation Group and President of Hermes was the moderator. “According to a World Travel and Tourism Council report the Travel and Tourism sector generated in 2016 more than 292 million jobs globally – that’s 1 in 10 jobs – and its global economic impact is more than 7.6 trillion USD. It is clearly in the vested interests of all those who benefit from travel and tourism to do what it takes to not only ensure that nothing is done to clip the wings of a sector that creates jobs and makes economies and communities take off but to also ensure that everything is done to develop a strategic and holistic roadmap to promote its safe, secure, sustainable and seamless growth. The future is no longer what it used to be but all aviation Stakeholders will need to work together to ensure that aviation is able to deliver its full social and economic value. To that end we must address smartly and intelligently the issues of taxes, connectivity and sustainability. Too many view air transport as a luxury for the wealthy or as a cash cow and some even as both as thus an easy target for taxation. research which showed that removing the UK Air Passenger Duty would result in an increase of up to £4.2 billion in GDP and the creation of up to 91,000 jobs. Germany has a EUR 1B air passenger tax since 2011 which more and more believe that the excise tax is costing the country more money than it brings in. On 21 August this year the German Economy Minister Brigitte Zypries said that she was in favor of abolishing the tax. The Dutch government introduced a departure tax on air passengers in July 2008 with the aim of raising EUR 300m. It ended costing the Dutch economy EUR 1.2B and was abolished in July 2009. The Austrian Air Travel Tax will be halved from 1 January 2018 but IATA argues that completely removing the tax would increase international travel by 2.7% and create 1700 jobs in Austria. Legitimate aviation charges that directly support air transport and are set based on open consultations with relevant stakeholders should be supported whereas aviation taxes should not. This is in line with ICAO Policy Documents 9082 and 86325. The CORSIA countdown has begun and all those that fly international services will in all likelihood need to start monitoring their emissions from 2019 whether their State has volunteered for CORSIA or not. Dealing finally with the European airspace fragmentation which costs at least EUR 3 billion a year and up to 50 million tonnes of carbon dioxide will clearly help. Aviation is a key facilitator of tourism as over 52% of international tourists arrive by air – a proportion that is significantly higher for remote destinations and islands. A nation’s competiveness, including in tourism, is directly related to its international connectivity. The July 2009 Intervistas Report on Mauritius forecasted that liberalisation of market access would increase international traffic to and from Mauritius by 979,000 passengers, reduce air fares by an average of 31%, create 10,400 jobs and increase GDP by MRU 1.26m. A 2011 Oxford Economics Report showed that aviation and tourism have a significant footprint in the economies of the Indian Ocean Islands of Seychelles, Mauritius and Maldives, supporting 27.2% of GDP and 187,000 jobs. In short, an international air access policy that promotes connectivity leads to increased air service levels and lower fares, which in turn stimulate tourism and bring about increased economic growth and employment. A restrictive national policy on air access is indeed a key impediment to travel and tourism whereas a liberal national policy on air access will encourage the competition which is essential to promote better service and better air fares and freight charges and enable more airlines to deliver on their real promises of socio-economic growth and jobs. The focus must be on promoting the National Interest which, of course, includes consideration of the National Airline interests but never at the expense of the National Interest. All of us in aviation know that we must always expect the unexpected! Disruptions whether man made or not represent the new normal. More reason for us to pick our fights and our friends. Airlines and airports are the two sides of the aviation coin whose value depends on having both sides! As interdependent partners we cannot work together on most issues and simply agree to disagree of some issues. Together we must fight for national, regional and international policies and regulations which promote sustainable development, connectivity and put competition and consumers at the forefront of policy development. Congratulations to Daniella Payet-Alis for making the front cover of the respected Business Magazine of the Indian Ocean. Madame Payet-Alis is a hotelier and the Owner of Seychelles Reservation Company and an elected Committee Member of the Seychelles Hospitality & Tourism Association (SHTA). She is a Seychellois national with a drive, and remains one who is committed to sustainable tourism development. Her statement “We do not need politicians, but we need entrepreneurs” made to the press in Mauritius speaks volume. She is today in partnership with her sisters in a number of small ‘home grown small hotels’. She is the daughter of Daniel (Dan) Payet of Praslin who with his Britannia Small Hotel & Restaurant and Dan Tours helped launch tourism on that island just after the Seychelles International Airport opened. The Port Management Association of Eastern & Southern Africa (PMAESA) in collaboration with Ministry of Transport, Works, Supply and Communications of the Republic of Zambia are hosting the PMAESA Conference 2017 from 22 – 23 November 2017 in Livingstone, Zambia. This event will bring together Chief Executive Officers and senior representatives of leading African Ports, Logistics, Funding institutions, Experts in trade, transport and maritime economics, Academia, Infrastructure development specialist and players in integrated tourism industries. The event is also aimed at representatives of the private sector, Regional and International Organizations to deliberate on challenges facing landlocked countries in the continent and the opportunities available thereof. The theme of this conference: Raising the Profile of Landlocked Countries in the Logistics and Maritime Value Chains will allow participants to have the opportunity to participate in various working sessions addressing critical topics such as: The Maritime Sector, Integrated Tourism, E-Logistics, The Blue Economy, Intermodal Transportation and The Development of Women in maritime and logistics within the context of the transport and logistics industry in landlocked countries. The event will for the first time feature a Port Awards ceremony whereby African Ports will be given due recognition of their achievements. PMAESA is convening this conference in a landlocked country, this is centred on the need to have an inclusive approach in addressing matters relating to maritime, shipping and logistics. PMAESA’s jurisdiction within the continent includes 11 landlocked member states with waterbodies which can be sustainably utilized for transportation of both freight and people. The role of landlocked countries is pivotal in responding to global competition, feeding and de-feeding of coastal ports, regional integration, intra-Africa trade and to grow the economies of landlocked countries. Direct connections between Mauritius and new markets are essential for further development of Mauritius tourism. Additional air routes to Europe and the Middle East have been announced by the authorities. As the last quarter of 2017 approaches, the opening up of Mauritius’s airspace has taken on a new dimension. After Saudi Arabian Airlines which made its maiden flight to Mauritius month, it will be the turn of KLM Royal Dutch Airlines to begin its Amsterdam–Plaisance service beginning on the 30th of October. “To support the growth of the last two years, we have to move towards buoyant markets. The arrival of KLM beginning in October will increase connectivity to Scandinavia, Eastern Europe and to Benelux. These are markets in which the MTPA and various operators have done a lot of work; they are also places where we have done road shows,” Kevin Ramkaloan, Director of the Mauritius Tourism Promotion Authority (MTPA) explained. The new connection via air routes will serve to close the circle of already established tourism by avoiding the need for visitors from Belgium, the Netherlands and Luxembourg to make large detours via Paris, Dubai or Germany. The new flights will be augmented by additional capacity from companies already operating in Mauritius during the high tourism season. Other developments at the European and regional levels are also anticipated. In addition, Air Mauritius is currently working towards broadening its offering. Beginning on the 28th of November, the national airline will offer weekly flights to Geneva, Switzerland. These seasonal flights will continue until the 23rd of February 2018. With the increased capacity, Mauritius tourism industry is well positioned to achieve a growth rate of 7% to 8% compared to the previous year, Kevin Ramkaloan emphasized. According to Statistics Mauritius data, the number of arrivals has been estimated at 1.36 million and revenues of Rs 58.8 billion are expected. This should allow the tourism industry to set new records.